Here's one example: You have a dedicated long distance route at your company. You also have a local Telco trunk route. The cost to call Area Code 312 is cheaper over the long distance route. If that long distance trunk route fails or becomes busy, you would like some callers to fail over to the local Telco route. The column to your right is a route list printed out. 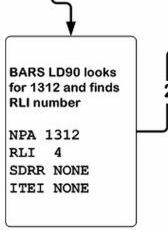 The RLI is the List of Trunk Routes an NPA, NXX or SPN can call out on.